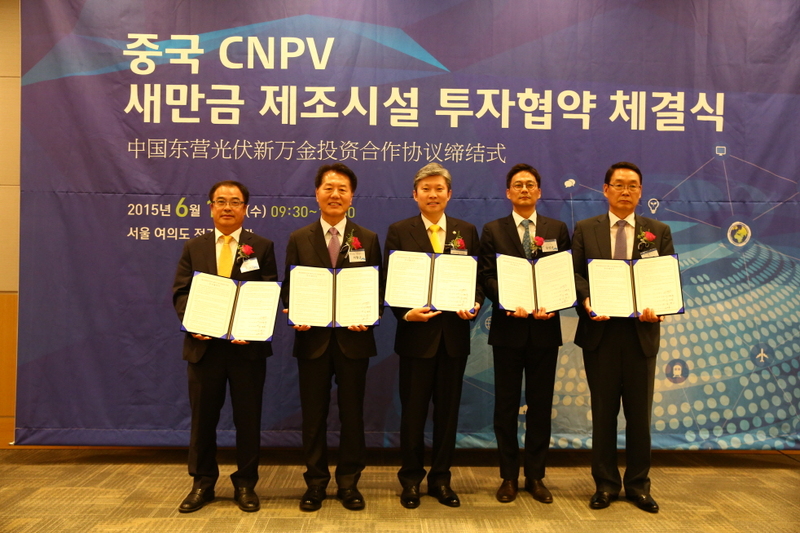 CNPV signed an agreement to develop 300 billion won (US$ 270 million) plant facilities for solar cell and module production in Saemangeum. The agreement was signed on June 10th at an investment briefing in Yeouido. CNPV's 'Greenfield' investment is the largest investment in Korea from a Chinese company. According to an official from the Korea Agency for Saemangeum Development & Investment (KASDI), 238.3 billion won (US$ 214 million) will be invested in constructing solar cell plants, and the project will lead to the creation of more than 300 jobs. CNPV said that the company decided to invest in Korea to benefit from the 'made in Korea' mark on their products, as solar cells and modules produced by Chinese companies are heavily taxed in America and Europe. As Korea and China have recently signed a FTA, the two countries are increasingly materializing plans for the development of economic cooperation complexes.